Taijuan Walker looks good, but not ready for prime time. Dave asked me to see last night’s Rainiers game. It was a good night to go. I don’t think I’ve ever found Cheney Stadium so welcoming with the warm weather and Dave’s excellent seats right behind the home dugout. Dave’s had seats down the third baseline for years, so I’m used to the awesome seats, but when the stadium remodel went through the Rainiers swapped home and visitors dugout. Before I was able to see the likes of Stubby Clapp and Rick Sweet close up, tonight it was Michael Morse and Franklin Guttierez. I was really excited about this game because there are a couple of young guys I’m really interested in: center fielder Abraham Almonte and left fielder Stefen Romero. David’s mentioned Almonte previously, as a good, if light, hitter, with speed, and an excellent defensive player. In an ESPN interview yesterday, Jack Zdurencik echoed this sentiment, and said Almonte probably had the best outfield arm in the present system on ESPN 710 yesterday. I was also interested in seeing Romero play. 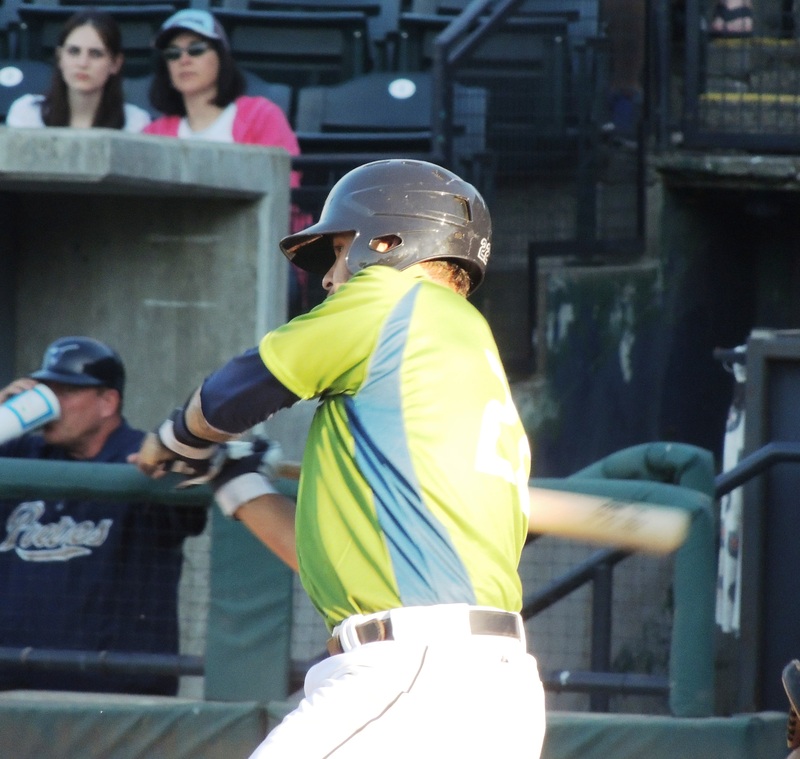 Romero was the M’s Minor League Player of the Year last year. Romero falls into the “bat without a position” category that guys like Mike Carp and Vinnie Catricala have had in the past, but others have suggested he is athletic. So I was excited to see him in left field. 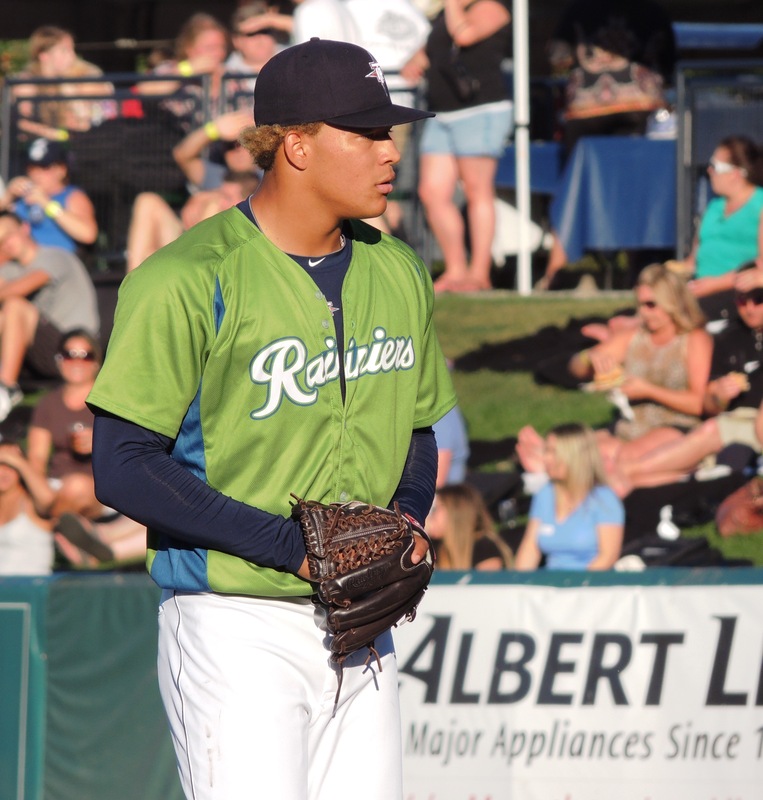 Taijuan Walker looks like a pitcher. Tall and lean, he has dominating stuff when he can command it. 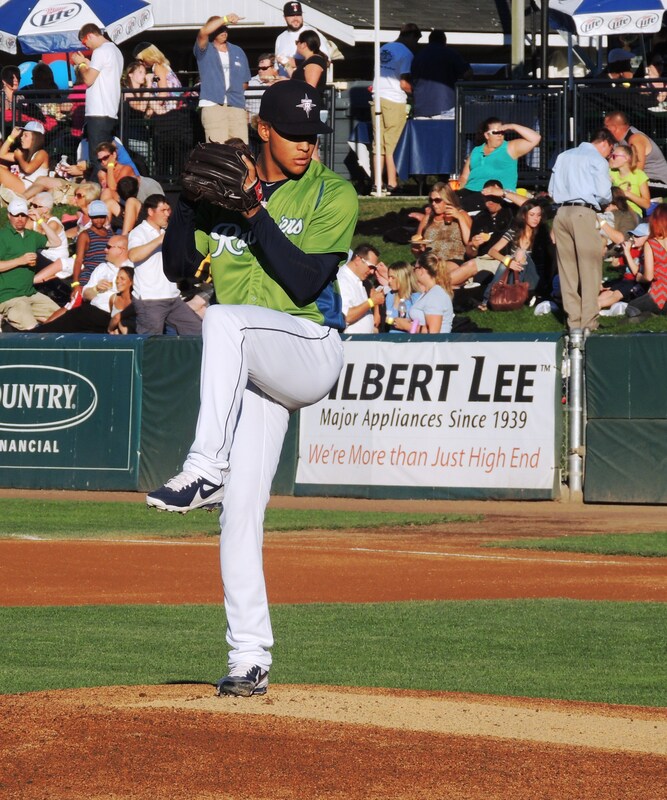 But the real draw was Taijuan Walker, the kid pitcher who is the gem in the Biig Three plus or minus however many. Drafted out of high school, Walker has steadily made his way through the minor leagues, impressing observers with his stuff along the way. I was not disappointed. Walker looks like a pitcher. Long and lean, he throws hard and has good stuff. His fastball was consistently in the middle 90’s, touching 96-97 on occasion. His breaking pitch is also very effective, some twenty miles an hour slower than his heater. But Walker’s outing was not without his problems. He gave up a homer to longtime Tacoma farmhand Mike Wilson (who received some applause) in the third inning. His problems were much worse in the fourth, as he struggled with command and allowed four runs. Though his stuff is dominating, Walker seems to try to strike out every batter, and he throws a lot of pitches. In his five innings of work, he threw 105 pitches. Bryan Sweeney, Carter Capps, Bobby LaFramboise and Josh Kinney also got in some work. It was great to catch Almonte and Romero. Though he didn’t have much of a night at the plate, Almonte made a great grab in deep center field going back on a ball. A little guy, he also made a super throw home. Though it was late, it was on the money on a line from 380 feet away. I was impressed. Romero had a hit and scored a run and showed some speed on the bases. He made the easy plays in left, but missed a diving grab in that maybe he should have tried. The kid is definitely athletic but needs a bit more time in the outfield. I’m confident we’ll get another look in September. Walker threw hard, but often seemed to be fighting himself. Two of the biggest draws of last night’s game, of course were two rehabbing Mariners, Franklin Gutierrez and Michael Morse. Gutierrez had a ringing double in the first inning. As the designated hitter for this game, there wasn’t a lot to see. He was hit by a pitch, which led Dave and I to question whether he would be moved to the 60-day disabled list. Morse is just flat huge. Didn’t do much at the plate and his bat looked a little slow. But the Sea Beast did make a nice running grab in right center. I was shocked. It was an exciting game as the Rainiers got out to an early lead. But Walker’s struggles gave Tucson a 5-4 lead that held until the 8th inning. 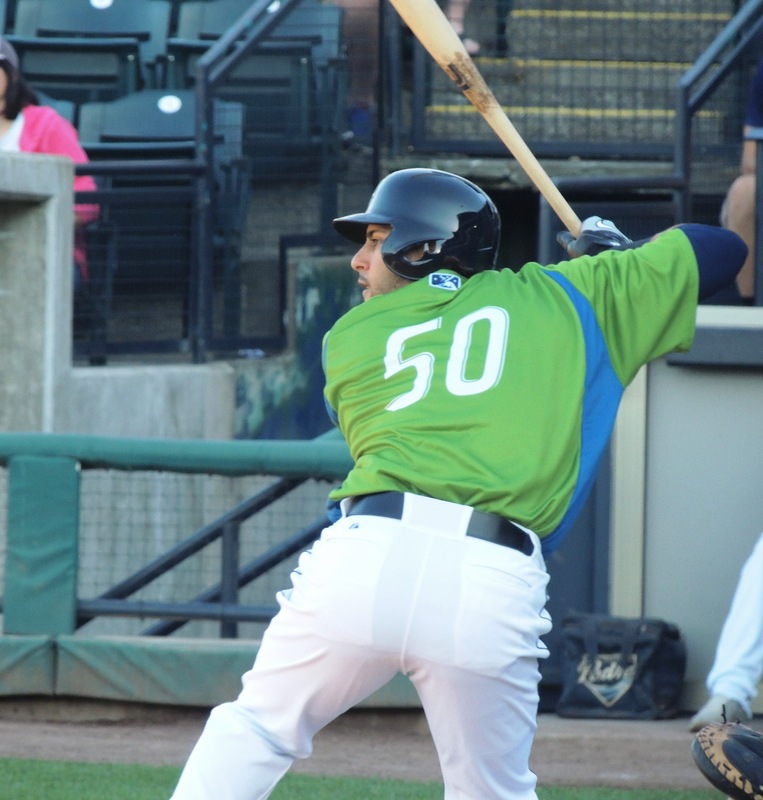 Catcher Jason Jaramillo drove in the tying run which forced the game into extra innings. First baseman Rich Poythress was the hero of the game however. He hit the walkoff homer in the tenth to send the crowd home 6-5 winners. It was a great game. Dave and I are a good match at a ball game. We’re both looking for the same thing: hustle, athleticism, and smart play. We’ll have to do it again. Michael Morse is a very large man. Stefen Romero had a hit and showed some speed on the basepaths.